The certification process is divided into two stages: The “Stage 1 Audit” and the “Stage 2 Audit”. The “Stage 1 Audit” consists of documentation review. During Stage 1, the ISO 27001 assessor reviews policies and procedures to ensure that appropriate policies and procedures are in place to meet requirements of the ISMS. The “Stage 2 Audit” consists of the ISO 27001 auditor performing tests of effectiveness to ensure that controls have been implemented to meet the requirements of the ISMS. 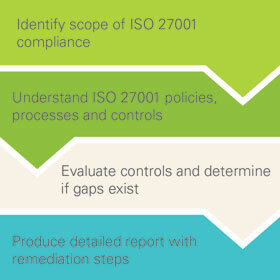 A periodic and independent internal audit of the ISMS against the requirements of the ISO 27001 standard. They do not have personnel that are truly independent. Those responsible for conducting the internal audit should not be auditing functions over which they have operational control or ownership. To combat these issues, organizations are outsourcing the internal audit requirement to CPA firms, such as Schneider Downs, that possess the appropriate knowledge of internal audit and ISO 27001. We begin our assessment by working closely with you to understand your business processes in order to understand your ISO 27001 compliance scope. We will work with and interview key individuals within the business and information technology services responsible for implementing the ISO 270001 controls to understand information security policies, procedures, and practices. We will evaluate your compliance with all control requirements through review of documentation supporting the operating effectiveness of controls. When our evaluation is complete, we will provide your organization with a detailed ISO 27001 compliance assessment report outlining corrective action plans with a detailed roadmap for achieving ISO 27001 compliance.